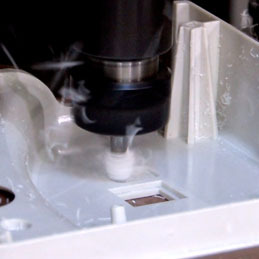 In-House Services: CNC Machining, Ultrasonic Welding, Heat Stake Inserts & Pad Printing at Protoplast Inc., OntarioProtoplast Inc.
CNC machinging allows for less capital expenses on tooling cost for short production runs. 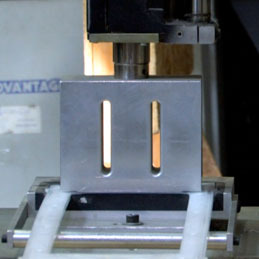 It also allow for quick engineering changes on prototype tooling. In the case of the photo on the right, 3 different versions of the same plastic housing are being CNC machined. With this method, only 1 version of the housing is molded, but 3 different versions are created by CNC machining different holes or slots. Ultrasonic welding is the process of welding 2 similar parts together by high frequency vibration that is highly localized on key welding areas. This process produces a water tight seal, with no fasteners or snap features required. Heat stake inserts is the process of heating brass threaded inserts, and pressing them into pre-molded holes in plastic housings. Once cooled, the inserts provide a very strong threaded hole(much stronger than plastic threads) for assembling a mating plastic part using threaded screws. Pad Printing Logos, Labels, Buttons, etc. 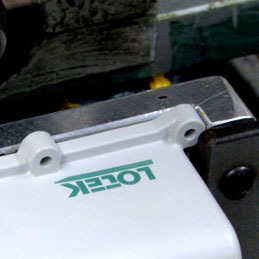 Pad printing is the process of printing ink onto plastic parts. Often plastic parts have irregular shapes and contoured surfaces that make it impossible to print directly onto them. With pad printing, a silicon pad is pressed onto a laser etched ‘inked surface’, then transfers the ink onto the plastic part by simply pressing down onto it.